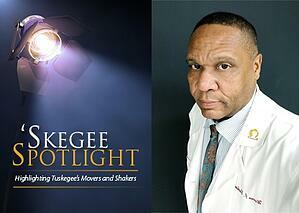 Warren Buchanan received a recent feature in the Skegee Spotlight as a mover and shaker of Tuskegee University. Because he is both an alumnus and a current employee, his legacy is thriving. Buchanan currently serves in the College of Agriculture, Environment, and Nutrition Sciences, and his family has worked uninterrupted for TU for over 70 years. He knew he wanted to carry on the legacy of working for the university, because it always felt like home to him. After Buchanan earned his master’s degree in counseling and student development from Tuskegee University in 1985, he was hired into the College of Agriculture, Environment, and Nutrition Sciences as a special assistant and the director of placement and assessment for the USDA Research and Extension Project. His work involves outreach initiatives to include students in research and extension projects, as well as inform them of opportunities in the agricultural field for education and future careers. During his time in this particular role, he has increased student enrollment and developed a close partnership with the admissions office to work towards common goals to educate students on major and career options. Buchanan enjoys helping students in personal growth while leading them towards professional goals, because agriculture provides a wide array of opportunity for students. To read the full story highlighting Warren Buchanan, visit the news article from the Office of Communications, Public Relations, and Marketing.